Lots of things happened today but nothing that I could really take a picture of. We took a tour of Meg's new school. I could have taken a picture of her there but I don't want to advertise where that is. We had my niece and nephew over for the afternoon but I don't think they were ever still long enough to shoot. Actually all the kids were that way. Meg, Mattey, and I did some summer reading. That's not really interesting, although the book I read was. Shiver. 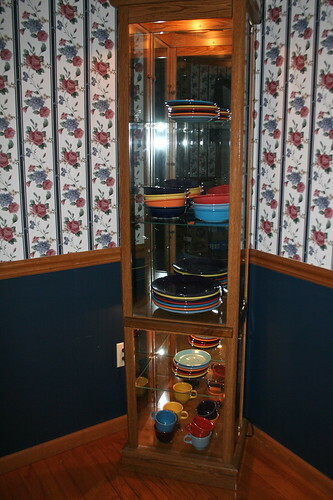 This afternoon while the kids were busy I did get my Fiestaware unpacked. The busy kids weren't in the dining room at the time. I made quesadillas for dinner. Later I ran a card over to my mom for her birthday. (She doesn't like her picture taken as I mentioned on Sunday.) Then I went to choir practice. On my way there I thought that would be a good idea for a photo but of course I didn't have the camera. Maybe next time. I came home to Mickey playing video games. I'll have to get that sometime. So....I decided the best thing to shoot at 10:00 p.m. was the Fiestaware. I have been collecting some settings over the last few years but I've never had them out of the box. I was worried about the kids breaking them. Okay, I might break one too. I also didn't have anywhere to keep them. So they've been stuck in boxes in the basement for a long time. Now they have a place of their own. And maybe I'll actually use them. Mickey bought me this curio cabinet for our first anniversary. It's also been stuck in the basement for years. I was happy to dust it off and store some colorful china in it. For those of you interested in our house, this is the dining room. It's one of four places with wall paper and only one of two rooms with color. (The people that lived here before must have been adventurous.) Now the wallpaper here isn't too bad, it's something I would have picked about...oh, 15 years ago, but I'll be ready to take it down soon. I'm thinking of painting the room purple, probably two shades since there's a chair rail. But before I can decide on the right shade(s) I have to pick colors for the enormous room that's made up of the family room, breakfast, and kitchen. I want the colors to work together. The things I like about the dining room are it's not right off the living room (it's a room all by itself), it has a beautiful hard wood floor, and the ceiling has a little tray detail that we love but never would have thought to ask for. I also like that it's one of two rooms with pretty much nothing in it. I have a table from my parents that I'm planning to refinish but is now stored in the basement. That's going to be a BIG project so maybe I'll just put the table up and put a nice tablecloth on it. We'll see. I'm sure I'll post about whatever I decide to do. P.S. For any occasion you would buy me a present I would like to add on to my Fiestaware collection. Hey Micky and Kelly! This is Jenny. Great website. I think the idea of painting the dining room purple is great! I painted mine that color, and it has a white chair rail. We love it! Very formal looking.. Hope all is well and we will see you all soon!